Having just examined him for the first time, the Miami pediatrician marveled at how bright-eyed and alert, yet calm, our 2-month old grandson, Charlie, was! She also noticed the beginning of torticollis to the right side…. meaning Charlie was holding his head to the right side much more than to the left. We had been so proud and happy to see Charlie tracking and smiling at us that we hadn’t realized we were almost always on his right side for stimulation. Knowing we shouldn’t panic, but realizing we needed to do something about this, we hurried home to reorient little Charlie’s crib /sleeping position, his changing table and even the placement of some toys. While he had been having plenty of tummy time and occasionally sleeping on his stomach since week 3-4, we increased both as well as making sure he was stimulating his left side. Feeling guilty about not noticing this development, as center-of-gravity head alignment is one of our specialties, we knew we should do much more than just simple repositioning. This spurred us to finish building our long-planned infant crawling track. The design plans came from Glen Doman’s book, Fit Baby, Smart Baby, Your Baby, a book that we would highly recommend for any new and prospective parents! While we had heard about the benefits of the crawling track for years, we had never seen one being used, let alone taken the time to build one. 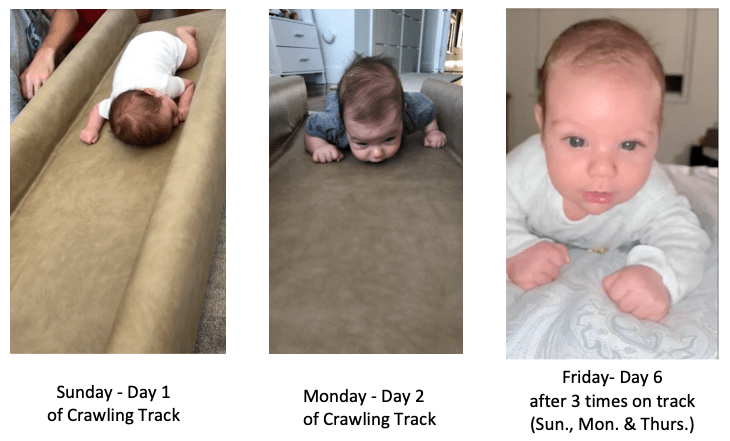 Watching Charlie crawl / maneuver down the homemade track for the first time was so exciting for this Minds-in-Motion Founder (and grandmother)! We were secretly hoping for good results but were blown away with the changes that transpired in under a week. What did we notice with Charlie? Changes in countenance – his face looks firmer and more responsive. Why is this so dramatic and important for parents & teachers to know? Our 20 years of Minds-in-Motion data has revealed the importance of strong neck muscles! Strong neck muscles indicate a strong developing core. We want our Minds-in-Motion babies to be able to hold their heads up as straight as possible as soon as possible. As a baby’s core is strengthening, the core muscles of the eyes and the 2 tiniest muscles of all -in the middle ear- are strengthening to send clearer perceptual messages to the brain. This will quick-start a child’s learning potential and set him/her up for success in any classroom in the future!